624130, Sverdlovsk region, Novouralsk, 2 Dzerjinskogo str. Our company produces more than 10 years nickel-cadmium batteries, which are used in various power supply systems. 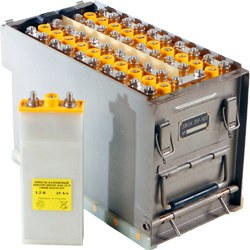 Accumulators NKM-40ST with a capacity of 40 A * h at a nominal voltage of 1.2, complete with mounting parts (tires, bolts, washers) are designed to assemble the batteries of an uninterruptible power supply. We represent a wide range of products, effective integrated solutions and the latest technology.